There are two Three's Company camps: fans who preferred The Ropers and those who loved Ralph Furly (Don Knotts). The Ropers, of course, were the first landlords of Jack Tripper (John Ritter) and his two female roommates - Janet Wood (Joyce DeWitt) and Chrissy Snow (Suzanne Somers). They were on the show for the first three seasons. Then, after season three, they left to have their own show, The Ropers, where they ended up being neighbors to The Jeffersons. In their place came Mr. Furly. And thus a new era in the show began. Season Four is a landmark in the show's history. Rather than jumping the shark, Mr. Furly added a new dimension to the show. Gone is Mr. Roper's inability to please his wife and his crude, angry old man attitude. But, instead we have Furly with his naive, sweet, and misguided ways, playing well with John Ritter's slapstick comedy. 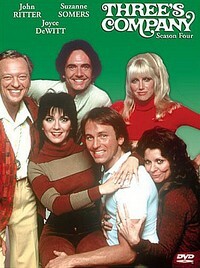 If you're a fan of Three's Company, than you remember the fourth season and its stamp it left on situation comedies. Here it is on DVD, including interviews with Don Knotts, Richard Kline (Larry, Jack's best friend), and Ann Wedgeworth (Lana Shields, the beautiful divorcee), as well as an interview with Ritter's first wife, Nancy Morgon Ritter, hosted by Joyce DeWitt. I'll give this an A.